For the last heraldic achievement this year I’ve chosen a woman who could have been entitled to an English and a German coat of arms. Her name is Sybille Bedford (1911-2006). Her full maiden name was Baroness Sybille Aleid Elsa von Schoenebeck. In 1935 Sybille became a British citizen, and above is the armorial achievement she may have been entitled to use in her lifetime. There’s no indication that she petitioned the College of Arms for an official grant. It is my personal interpretation of her heraldic heritage. First, the shield. Ignoring the little blue shield in the centre this design was used by the von Schoenebeck family since the mid-1600s, probably after the marriage of Gerhard von Schoenebeck to Sybilla von der Lippe. The von Lippe and von der Lippe families have been using a rose as their emblem since the 11th century. With this marriage came estates belonging to the von der Lippes and Gerhard may have adopted the rose to honour his wife’s family. This borrowing of emblems was common in medieval heraldry. Sybille Bedford was directly descended from Gerhard and Sybilla. German heraldry has several different rules to English heraldry. The German states that were part of the Holy Roman Empire had no central heraldic authority like the English College of Arms. German families were free to adopt any design they wished. As a consequence there were an estimated 3 million German families who were using coats of arms by the time the Holy Roman Empire ended in 1806. There were a handful of unofficial authorities who registered coats of arms for a fee. Only around 4,000 of the 3 million German arms had been registered by 1806. I assume the von Schoenebeck arms were one of them as they appear in several German heraldry books in the 1820s. Since 1916 German arms and achievements have been registered with a number of specific authorities being licensed for the purpose. Another difference between German and English heraldry is that German coats of arms can be used by all members of the family without alteration, whereas in England a coat of arms, specifically one displayed on a shield, must be individual and not like those of any other person (except when it appears in what is called a “quarter”, as in the arms of multiple heiresses). In England unmarried women display their coat of arms on a lozenge. In Germany Sybille Bedford she could have used the von Schoenebeck coat of arms on a shield like her father. She could also use the full achievement with helmet and crest, which she couldn’t in England. German coats of arms are also always shown with the crest. This is because there are so many coats of arms and some may be identical. A distinctive crest helps to distinguish one from the other. Before she became a British citizen her achievement would have been the one illustrated below. In the 1920s Sybille Bedford moved to England to get away from the emerging fascist regimes in Germany and Italy. When the Nazi’s discovered her family’s Jewish ancestry all her bank accounts were frozen and she was refused a passport. Living penniless in England and unable to travel she had to find a way of obtaining a legal passport. It was suggested that she entered a marriage of convenience with a gay Englishman. In 1936 Sybille married Walter Bedford. The marriage didn’t last long, obviously, and not a lot is known about her husband. However, there’s no record of him having a coat of arms which, at the time, would also mean that Sybille didn’t either – women were not entitled to use their father’s arms after they got married, unless they were an heiress. Fortunately, Sybille Bedford lived to see a change in English heraldry. If we assume that she applied to the College of Arms to have her German arms officially approved then her heraldic achievement would be the one at the top of this article. 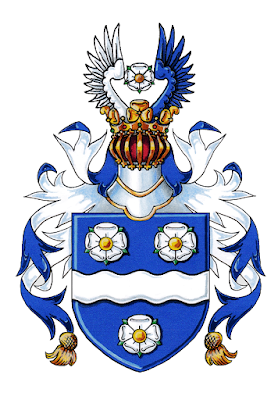 In 1997 the College of Arms ruled that married women could still display their father’s coat of arms even if their husband hasn’t got one by placing them on a shield with the addition of a smaller shield. This smaller shield could be in any colour and in any position as long at it followed establish heraldic rules and can be seen clearly. That’s why I’ve chosen to put a blue shield in the centre. It would look wrong to put a yellow shield on one of the roses. 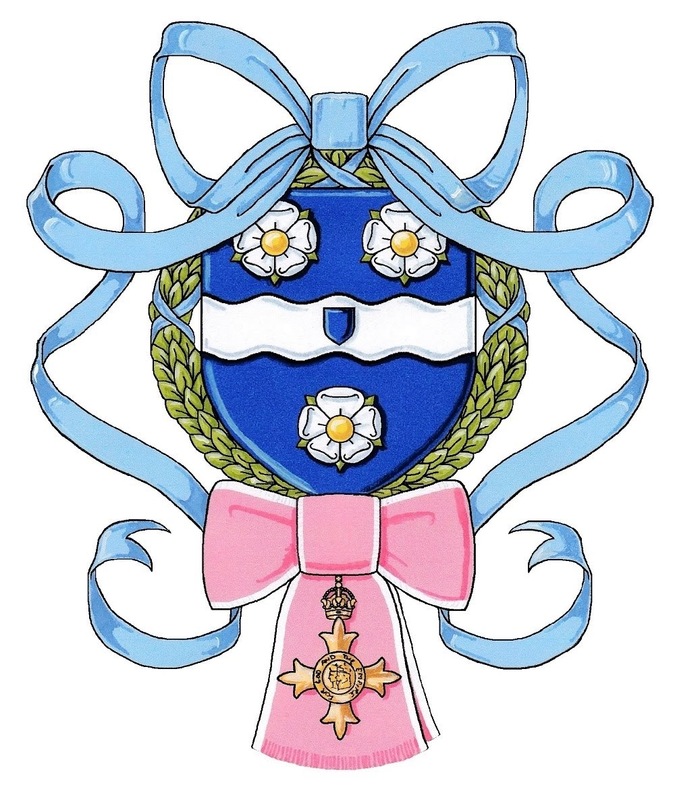 The blue bow and garland around the shield are customary for a woman, regardless of marital status (peeresses and dames can replace them with various other insignia). As far as I can tell Sybille Bedford did not divorce her husband and was still married to him when she died. This would make a difference, because on becoming a widow Sybille would have to take the shield away and show her arms on a lozenge. Until we know for sure, let’s assume her husband was still alive. Sybille was awarded the OBE (Officer of the Order of the British Empire) in 1981. 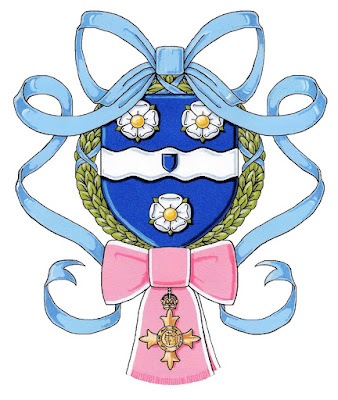 The gold badge of the order is shown below her shield with the ribbon tied into a bow, as it is worn by women. Finally, I will just say that even though I finish my blog officially (full-time) at the end of the year I intend to produce another heraldic alphabet article for International Heraldry Day on 10th June 2019. By then I may also have produced a small book for sale with all the heraldry articles expanded and amended. It is one of several products I plan to produce to help finance displays and exhibitions for LGBT History Month, Pride, International Day Against Homophobia and Transphobia, etc.